It was late in the day when I returned from the hospital yesterday, but I did not have to stay there, and that was a good thing. I awakened late this morning, and although I feel as though I have been trampled by elephants, I am cheerful for all that. These early tulips bloom in a sunny, sheltered alcove in a friend's garden, and dappled with early dew, they are always a treat for the eyes. If not quite as rosy and "in the pink" as they are, I am working on it. Sending healing energies to my blog-friend and beautiful artist, as you cleanse from chemo! Sending you love and many prayers for vibrant good health! 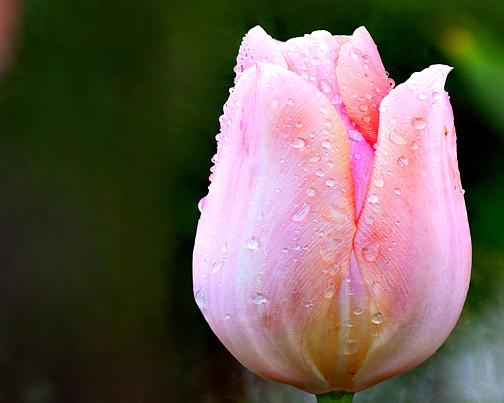 It is my hope and directed energy that you will be pinkening up rapidly, to match these beautiful tulips! Every word a singing pebble... strength, radiant, healing, good health, good vibes... I wish all of these little but mighty singing pebbles for you my friend! Cheers to you. I love the gentle delicacy of these flowers. I am so glad you are home, and I wish you all that you need for the days ahead. So glad you did not have to stay and that you can still find such inspiration in the beauty of nature that surrounds you! They say, nature is the best healer...Hope you continue to Pink Up! Glad they discharged you! Hope you continue to bloom and will be in the pink yourself soon! 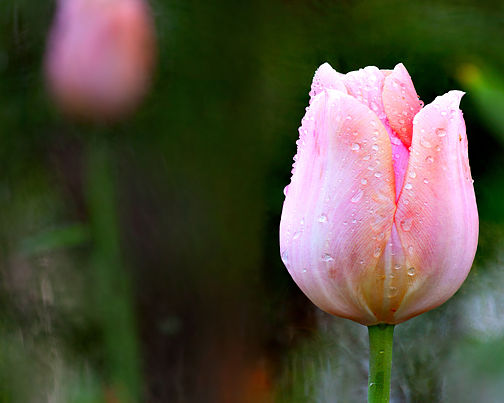 Pouring here, but my tulips are singing despite the cold rain. Wishing you days of Light and sunshine ahead as your neck of the woods defrosts. So delighted to hear you are home! Hoping you are resting well, big sister.